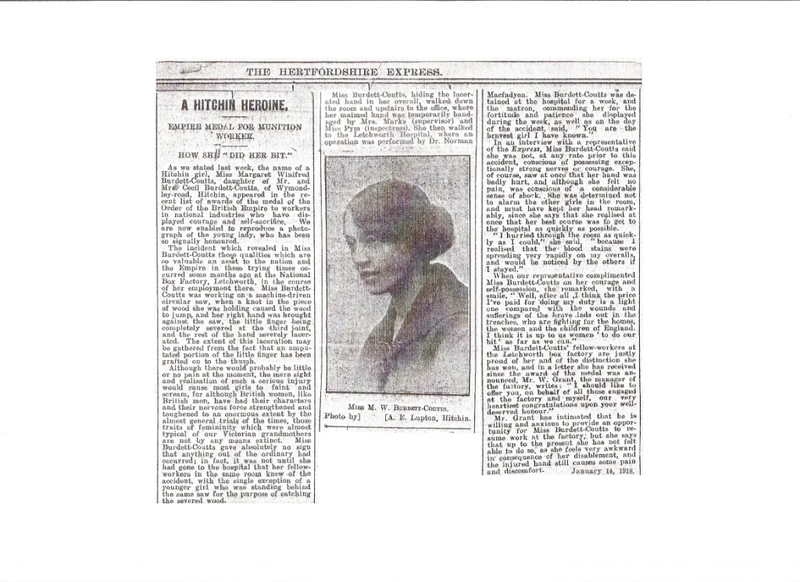 A pupil from Hitchin British School "does her bit"
That was a headline in the Hertfordshire Express, January 14 1918. The subject was a brave Hitchin girl, Miss Margaret Winifred Burdett-Coutts, of Wymondley Road. She had recently been awarded the medal of the Order of the British Empire, given to workers in national industries who had displayed courage and self-sacrifice. 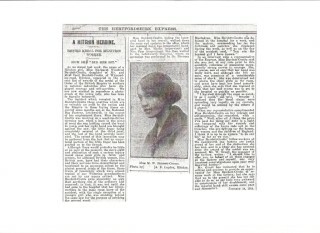 The article described how Miss Burdett-Coutts had displayed “the qualities which are so valuable to the nation and the Empire in these trying times” (The Great War of 1914-18). Some months earlier she had been working in the National Box Company, Letchworth, with a machine-driven circular saw. A knot in a piece of wood made the wood jump; the saw severely injured her hand. The paper gives quite graphic details of the injury, but also describes how Miss Burdett-Coutts quietly (“so as not to alarm the other girls in the room”) walked to the supervisor’s office for first aid. She then walked to Letchworth Hospital, where her hand was operated on. She told the reporter “After all, I think the price I’ve paid for doing my duty is a light one compared with the wounds and sufferings of the brave lads out in the trenches. I think it is up to us women ‘to do our bit’ as far as we can”. This page was added on 17/09/2010.